Janus is a collaboration between J. Warwick Guitars and Triple C Woodworking. Janus was the Roman god of gateways and beginnings, often depicted as having two faces looking in opposite directions. Janus is comprised of 30 year "old growth" Brazilian/Amazonian Rosewood back and sides, Carpathian spruce top, Mahogany neck with Ebony fingerboard, and bridge and headstock overlay. Janus also has Bloodwood binding with Maple purfling and a Maple/Bloodwood bound soundhole. Waverly engraved gold tuning machines adorn the headstock. The carvings combine both Bloodwood and Maple with both the rosette and headstock frames being Bloodwood and the buttplate overlay and the two faces of Janus carved from Maple. The neck heal is relief carved directly into the solid mahogany neck. Originally dubbed the "Collaboration Guitar", creating Janus began in the winter of 2007 as a dream collaboration between local guitar builder Jim Warwick and woodcarver Rob Mock. Combining their talents into a classically beautiful yet unique instrument became an exciting and enjoyable experience. The imaginations of both played as big a part in the building of Janus as their physical skills, making a beautiful sounding instrument become a palette for woodcarving. The results yielded a visually stunning yet amazing sounding guitar. We felt that the name Janus was fitting in many ways, this guitar meant a "beginning" for both of us making guitars together. A "gateway" between the craftsmanship of guitar building and the art of woodcarving. Lastly, Janus not only has two faces, she has four. We hope you enjoy this collaboration as much as we enjoyed making it. $14,999.99. We wanted Janus to have classic feel and look, but also to be something that people had not seen before. The soundhole inset is hand-carved maple and is held in with magnets, allowing future access through the soundhole. The headstock on Janus is unique as well. The carving goes through the headstock with the face seductively looking forward and her hair flowing out of the back. The neck heel reveals two more of Janus's carved faces along with a carved flower. Tiffany is the third collaboration between myself and Jim Warwick of J. Warwick Guitars. It was inspired by and named after Tiffany-style lighting. Tiffany began, as many of our projects do, with a simple vision of a stained glass or Tiffany-styled inlay. From that simple vision, a more intricate creation evolved. Tiffany is constructed of a solid Bearclaw Spruce top; solid Flamed Maple back, sides, and neck; and Ebony fretboard, binding, bridge, and inlays. 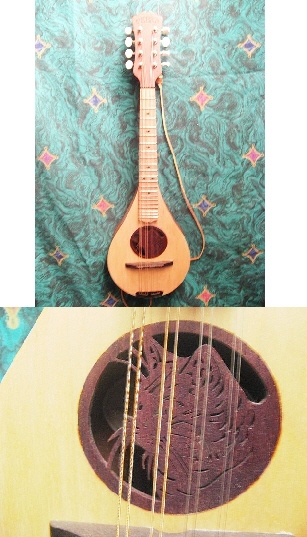 The inlays are underlayed with Abalone and the soundhole is a single ring of Abalone. The neck heel has a hand carved mirror-image scroll design. As with all of our collaborations, Tiffany is completely hand-made. Price $7999.99 SOLD to a private collector. 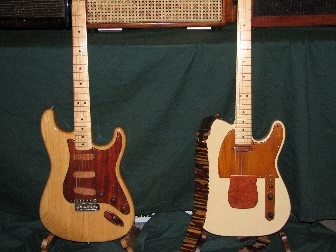 Trixie's Combo is a one-of-a-kind Western Carved American Strat and matching Valvetrain Po-Boy amplifier. I do not punch a clock when I carve. However, my best estimate is that it took approximately 1100 hours, over a period of 17 months, to complete. The guitar body is Alder, with a Mahogany pickguard/backplate, Cherry knobs, and Maple overlayed Ebony tuner buttons. 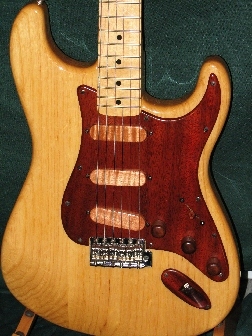 The guitar has Fender Sumarion Cobalt pickups mounted under the pickguard. The amplifier was hand-made by Rick Gessner at Valvetrain Amplifiers. The amp and guitar are named after my little girl, Trixie -- a high-strung, nervous Sheltie/Chow mix my wife and I adopted from a local animal rescue. These pictures were taken by Bob Merhaut of Robert Merhaut Photography. He saw Trixie's Combo and offered to take pictures of it in his studio. As much as I like taking pictures, it is nice to see how it looks with a professional touch. Vines is the result of Jim*s vivid imagination and Rob*s adaptation of Jim*s provocative ideas. Specifically, Jim, recognizing Rob*s adept scroll saw skills, wondered if a flat piece of wood could be cut with a scroll saw and shaped to configure to the sides of a guitar, while still providing the support needed to sustain the body of the guitar. Never refusing a challenge, they created a novel design that sufficiently depicts an elaborate visual image, while retaining enough wood to ensure the guitar*s structural integrity. Jim*s imagination continued to grow. Specifically, he determined that creating unconventional vine-shaped braces would add further beauty and depth to this masterpiece. Similar to the strategy used to create the sides, Jim and Rob determined the areas in which the braces needed to come in contact with the guitar to provide sufficient support. Rob then proceeded with carving a labyrinth of Maple and Sycamore vine braces. Further intricacies comprising Vines include Flamed Maple neck, binding, body, and fretboard inlay. Hand-carved leaves adorn the neck heel, headstock, and soundhole. The back and sides of the guitar are made from Black Acacia and the front was created from 30+ year old Redwood found in Rob*s barn. Just weeks before completing Vines, Rob and Jim determined that this splendid creation needed to be placed in a proper setting and a complimentary stand was created. The vine stand was created from Spalted Maple and the base is mad from Flamed Ash. Vines demonstrates that notions deemed unattainable can, in fact, become reality. Jim remembered to snap a few pictures just prior to gluing on the top. Glad he did, for this view will probably never be seen again. 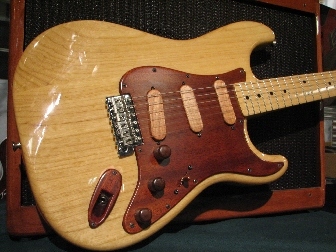 This is a 70's reissue Stratocaster. When a co-worker saw a guitar that I had "woodified". He asked me to do the same to his Strat. It is outfitted with solid Maple pickup covers, toggle switch knob and input jack, solid Mahogany pickguard, and Walnut knobs. Here are Woody II and Woody III hanging out together.